According to reports, Real Madrid have identified Jurgen Klopp as their number one target to manage the team next season. Real Madrid are struggling this season and are currently 12 points behind their bitter rivals, Barcelona in the league table. Los Blancos were also knocked out of the Champions League and Copa del Rey by Ajax and Barcelona respectively. 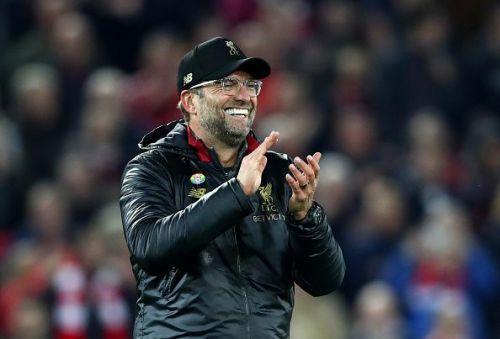 On the other hand, Jurgen Klopp is currently among the best managers in the world and completely transformed the Reds in around three and a half years. The Merseysiders are currently second in the league table and are chasing their first league title since 1990. The German manager also guided the Reds to the finals of the Champions League last season but unfortunately lost 3-1 against Real Madrid in the finals. According to the reports by Independent, Real Madrid are interested in appointing Jurgen Klopp as their permanent manager next season. Los Blancos started the season poorly under their ex-manager, Julen Lupetegio and are now struggling under the guidance of Santiago Solari as well. The Madrid-based team scored 43 goals in the 26 La Liga games this season and conceded 31 goals during that period. Mauricio Pochettino and Max Allegri are also being considered by the club. Jurgen Klopp's current contract with the Reds will run till 2022 and the German is unlikely to leave Liverpool anytime soon. Real Madrid will make a trip to north-west Spain to play Valladolid next before hosting Celta Vigo at the Bernabeu Stadium on March 16. On the other hand, Liverpool will play Burnley next in the league before making a trip to Germany to play Bayern Munich for the second leg of the Champions League round-of-16 tie on March 14.